Crammed into a narrow break in the dramatic rocks of the wild west Roseland Peninsula, Portloe sits at the end of a steep wooded valley in one of Cornwall’s most remote areas. Forgotten or resilient to the modern house builders who have changed many of these coastal villages, you can walk round Portloe now and see very little change from 200 years ago. A gaggle of whitewashed cottages cling to the cliffs above a tiny slipway that still houses a few fishing boats. Its a remote and hardy spot, with instant access to stunning walking, wild cliffs , an air of seclusion and for those of us who do not live there a sense of an older time long past. 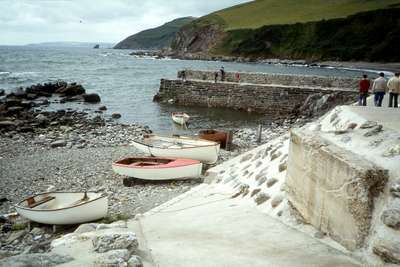 Portloe (meaning 'cove pool' in Cornish) was established around a small fleet of pilchard boats. It was a tough and dangerous life in this remote spot. The village church was once the lifeboat house but it was abandoned after 17 years as the boat could never be launched in stormy conditions over the waves that crash through the slit of water at the foot of the little slipway. Today the few boats that remain are dragged up the slipway as they were hundreds of years ago. The Lugger Hotel now a small exclusive upmarket hotel is the only real change. This building was a focal point for local smuggling during the late 19 Century when as an inn the landlord Black Dunstan was hanged here for bringing in French Brandy and hiding it in the cellars. Uphill from the slipway is The Ship Inn the one meeting place in a village which now no longer even has a shop. Stuffed with nautical memorabilia this tiny former fisherman’s cottage has all atmosphere with good food and ale befitting this unspoilt and semi forgotten village. From time to time the place has been disrupted, its untouched nature having been noted by TV and Film producers looking for a rather idealised West Country back of beyond location. 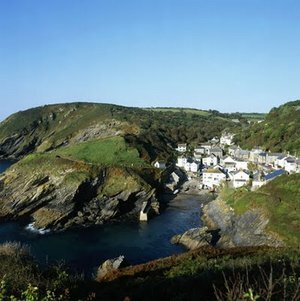 Portloe has been used for shooting the Dawn French comedy Wild West and in the past The Camomile Lawn, Saving Grace, Treasure Island and even in the film Irish Jam where Portloe was deemed unspoilt enough for use as a Irish village stand in. If this is your first night on the coast path you won’t forget its wild air and remoteness particularly as you move on to larger more tourist orientated harbour towns further round the coast. There may be no art shops, restaurants or harbours to take an evening stroll round but of course this is its contrast and its attraction. At night it’s a magical spot out here to wander under the stars to the slipway and gaze out alone to sea below the dark twisted Igneous rocks known here as the foreboding “Jacka”. Another place with a past based upon pilchard fishing and the proceeds of smuggling contraband, Mevagissey today remains a tight knit maze of fishermen's cottages, character pubs and quayside restaurants surrounding a compact and imposing harbour that whilst very different to tiny Portloe is also a delight to wander round. 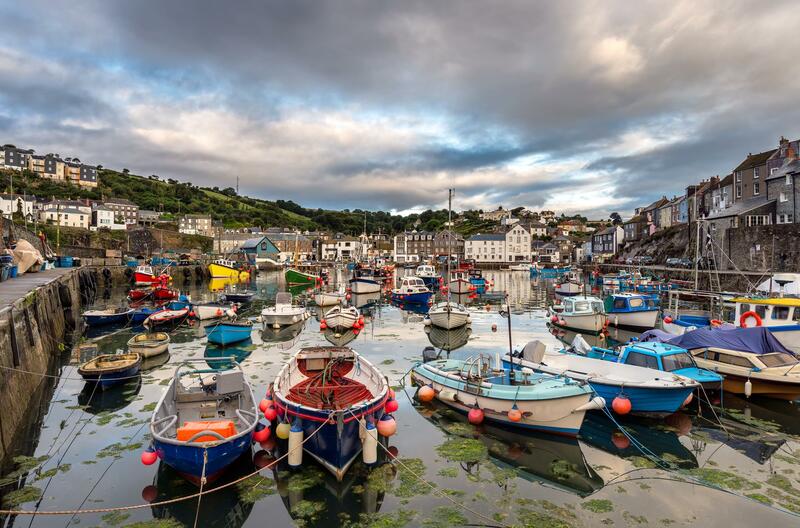 Large enough to be called a town, Fishermen still land local skate, lobster and plaice in the heart of a village with a classic Cornish feel, surrounded by stunning coastline, lobster pots and images of the sea. The large double walled harbour is the centre of town full of fishing boats and at the end of the harbour wall you can enjoy fine sunset views out across St Austell Bay to the Gribbin Head Daymark two days walk away. Highlights for those that want to explore further include the little lifeboat house, the surreal aquarium on the Harbour Wall which holds any oddities the fisherman bring in and a very informative Mevagissey Museum. The museum building was originally built to cover the construction and repair of the town's vessels with timbers "borrowed" from older boats and the spoils of the wreckers. Inland little alleyways still support some old seafarer’s pubs and these days a handful of excellent fish restaurants making it a good place to recharge after completing the Roseland Peninsula. As ever those arriving from the trail in the afternoon get the best of the town as the inevitable day tripping crowds start to disappear as you wander in and normality returns with the sunset. 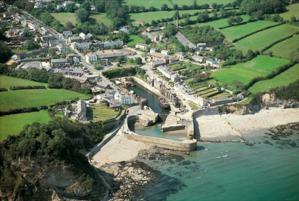 Always lively, June sees a week of festivities at the harbour with gig racing, floral Dance's and plenty of local beer. 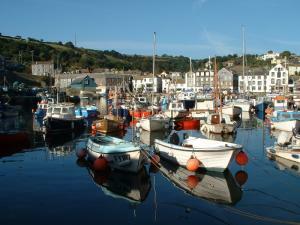 A short video on Mevagissey and its glorious seafood! For those on a rest day two miles inland and easily walked to from Mevagissey you can access the world-renowned Lost Gardens of Heligan. Having fallen into disrepair after the great war The gardens, rescued by Tim Smit (who went on to create the Eden Project), were rescued by a team of volunteers from a jungle of bramble and undergrowth after years of neglect and now boast an amazing array of fauna and flora. There is a lost valley - a jungle of bamboo and ferns dotted with sculptures, ponds, fairy grottos and wildflower meadows as well as fully restored flower and vegetable gardens including 18C pineapple pits and the worlds largest Rhododendron bush. 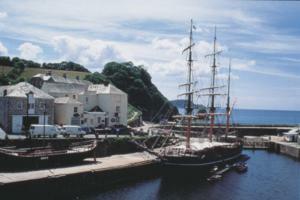 The tiny port of Charlestown with its tall ships and dramatic harbour retains the best of Cornwall's trading maritime past with some excellent modern facilities and attractions. A favourite location for period movie sets, The Eagle has Landed; The Three Musketeers, Mansfield Park and A Respectable Trade are just some of the films that have used this stunning location for their shoots. The history of the harbour is tightly entwined with the local china clay trade which passed through here for over 200 years until finally ending in the early 1990s. Based in one of the china clay storage houses, the Shipwreck, Rescue and Heritage Centre covers not only the history of the harbour but of maritime in general. Entered through underground tunnels that were used to transport the clay, highlights include the largest collection in the UK of artefacts recovered by divers along with displays on local shipwrecks and clay mining. The harbour itself is a peaceful and scenic spot from which to enjoy food from a few well located restaurants and tea shops whilst gazing up at the rigging of the three old fashioned square riggers which are often moored in the harbour seeking protection from the sea. 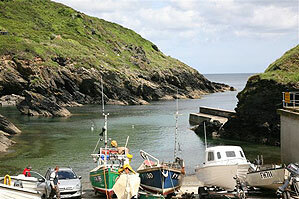 To each side of the harbour are pleasant rock pool beaches and fine views back towards Black Head and Mevagissey. Staying here gives you the chance to eat well and relax by the tiny cobbled quay and the maritime artefacts of days gone past. Inland and around 3 miles away is the world famous Eden Project and for those wanting to take a day out to visit you can catch a bus, walk in or cycle along newly created “Clay Trails” to the project from Charlestown. Just a collection of plants then?! ...Try again! "The Eighth wonder of the world....?" "The living theatre of plants and people....?" Don't dismiss the hype... for once its fully justified! 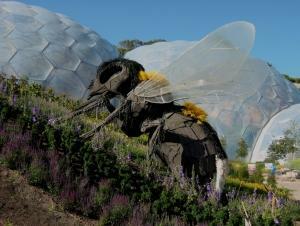 You just cannot visit the Eden Project without being amazed at the sheer magnitude of it all. This incredible project is awesome from the moment you arrive on the rim of the former clay pit and gaze over the immense domed biomes. With each biome big enough to hold the entire Tower of London, at first glance it looks like you have stumbled across an alien colony here on earth. 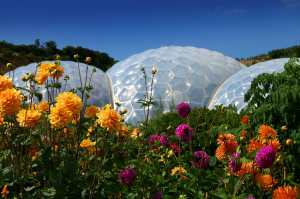 The Eden Project is rightly top of most people's list of things to see in Cornwall and if you are walking along the coast path you should not miss the opportunity to visit. If you have visited before..... don't miss out on how Eden is evolving - no two visits will ever be the same. Different seasons bring completely new plants and panoramas. 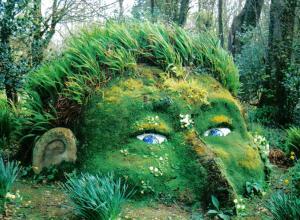 New and exciting projects, displays and events keep Eden a vibrant and ever changing attraction. The Education Centre opened in September 2005 and plans are well underway for the new arid zone biome. From the wintertime ice festivals where you can skate on a rink under the biomes to the concerts, gigs and parties on the turfed arena in the summer there is always something on at Eden and you should never feel you've seen it all! 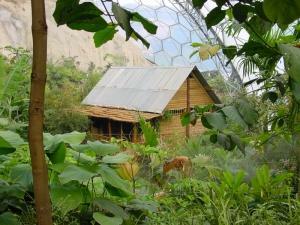 The Eden Project was conceived in 1994 by Tim Smit, who was also responsible for recovering the famous Lost Gardens of Heligan and the Project aims to visually present a story of man's dependence on plants. Constructed in a huge clay pit crater 60 meters deep, the Eden Project opened to the public on 17th March 2001 and by June 2001 the millionth visitor had passed through the gates. From the entrance to the attraction, gaze in awe at the spectacle in front of you. You can see it all laid before you, a stunning panorama of crops, flower beds and terraces surrounding vast Biomes, the largest Conservatories in the world. Wandering through carved driftwood sculptures and blankets of flowers, the Outdoor Biome includes not only endangered and unusual plants from Cornwall but plantations of hemp, tea, hops and other flora from temperate parts of the world that share a similar climate to our own. The steeper slopes are designed to resemble areas such as the prairies and the terraces of Chile. Over 300,000 daffodil bulbs bloom from early March to May- bulb mania in all its glory. The Humid Tropics Biome, is a steamy journey into the rainforests. Tall enough to accommodate trees from the tropical rainforests it will still take 50 years for the mahogany trees to reach the roof of this amazing dome. Inside, kept humid by its own integral waterfall and river, are over 1,000 weird and wonderful plant species from the likes of Malaysia, West Africa, South America and the Pacific Tropical Islands. In the controlled environment insects, butterflies and lizards patrol amongst palms and bananas, rubber trees, rice, cocoa, coffee, sugar, pineapples and bamboo. The Warm Temperate Biome represents the Mediterranean regions, parts of California, Australia and South Africa. Plants in the Warm Temperate Biome include the tobaccos, maize, and cottons of the Americas with the grape vines, olives, peppers and lush fruits of the Mediterranean. Eden is also about education, research and sustainability. Throughout the project the fab food and drink centres, gift shop and visitor facilities are committed to recycling, sustainable development and supporting local communities across the globe. Everywhere you go in Eden, you will find the references to the Global Community we live in along with evidence of the endless array of cultures and environments that this community represents. Play your part in all this by visiting this fantastic monument to the world we live in, its diversity and its beauty, and continue on your way by bike or on foot for a truly sustainable and inspiring visit. The beautiful town of Fowey - note now to avoid local embarrassment, its pronounced "Foy" as in "Joy" and the place is just that - without doubt in our opinion the highlight of the overnight stops on this section. 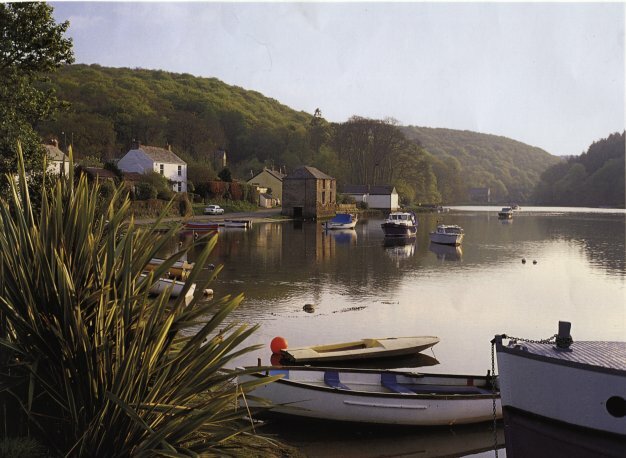 A stunning working port and natural harbour at the mouth of the impressive River Fowey Estuary which teems with wildlife, the town gives access to a run of tranquil coves, creeks and tiny beaches. Somewhat unique in modern Cornwall by retaining its historic charm without too much compromise to modern day visitors, it clings to the hill side in a maze of atmospheric winding streets of medieval and Tudor cottages that offer breathtaking views across the bustle of the river below.Steeped in maritime history, its fortifications and rugged cliff top boundaries have been occupied since Roman times and its population has defended itself against everything from attempts by the Spanish and French to raze the port through to resisting the ruin of modern tourist trappings leaving an unspoilt and unique south coast haven. Drake, Raleigh and Cook have all passed through here whilst Charles The First was shot at and nearly ended his days here. The port has brought inspiration to writers such as Kenneth Graham (up river for sections of Wind in the Willows) and Daphne du Maurier (Rebecca, House on the Strand and a Kings General were just some of the books she set here). 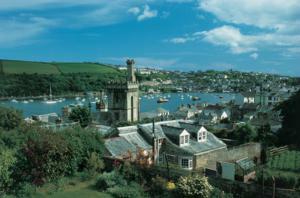 More recently its recognition came from those who voted it the most desirable place to live in the UK. 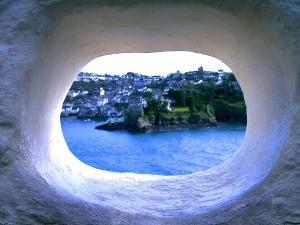 Fowey holds a fantastic position and character all of its own and it is a joy to wander through its quays and harbour side browsing the unique and unusual shops, art galleries, restaurants and pubs. With plenty of visiting boats mooring overnight the town is always a lively place to visit and there is always something going on around town from its fantastic nonstop carnival party during Regatta Week (Aug) through to the Daphne du Maurier Literary and Arts Festival in early May. For a rest day Fowey is probably the best choice on this route, there is much to see and do for those with the energy or no more perfect spot to just relax in and absorb the harbours sights for those who do want to just give their feet a rest. The ruins of St Catherine’s Castle with superb views over the estuary stand above the old smuggling beach at Readymoney Cove ideal for a refreshing dip. Inland wandering the tiny streets around the harbour you can take advantage of renowned quality restaurants and Michelin starred bistros whilst mingling with those moored up on visiting boats and yachts as they relax on shore leave. The Pubs and cafés have a very continental feel to them enjoying fantastic balcony views out over the comings and goings of the harbour to the cliffs, hills and coastline beyond. Catch the tiny passenger ferry across the harbour for a visit to Fowey's sister village, Polruan with its huddles of cottages hugging the cliffs above a tiny quay and the area’s last working boatyard or just hang out in Fowey wandering and browsing through lanes full of unusual and unique local art, craft, and bookshops. In town you have the small but fascinating Fowey Museum, housed in the old Town Hall as well as a tiny aquarium and ancient ruined Blockhouses which protected the port in days gone by with a giant chain stretched across the mouth of the river to stop raids by the French and Spanish. The Daphne du Maurier Literary Centre is based here as were many of the writer’s books and staying in Fowey gives the chance to wander past locations from several of her works. One of Cornwall’s classic walks “The Hall Walk” runs from here round an inland estuary using two small ferries. At only 4 miles it’s perfect for a “rest day” amble with the most fantastic views of this natural harbour area complete with wooded creeks and old shipwrecks. For those wanting to get out onto the water our sister company Encounter Cornwall can arrange inland canoe expeditions built in to your walking holiday on the tranquil Fowey to Golant and hidden Lerryn through wooded creeks alive with wildlife and mysterious beauty. 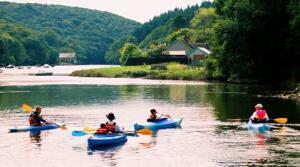 If Fowey is the gateway to River Fowey Valley, then halfway up the estuary and hidden away up its own stunning creek, Lerryn is its gem. We should know! We live here and we wouldn't swap it for anywhere else in Cornwall! On the Fowey Estuary Walk, we also often use Lerryn as a base for those arriving or departing in Mid Cornwall for other coast walks. It’s not well known and is therefore unspoilt by mass tourism and as a decompression chamber either when arriving from or departing to the hectic modern city its perfect. Pronounced "Ler-in" the name is Cornish for 'waters' and it is the constant coming and going of the tidal river that gives the village its appeal and its ever changing scenery. Nestling at the head of the creek at the tidal limit, the village is surrounded by miles of wild, dense woodland and forest downstream with farmland and meadow upstream above its medieval bridge. Well hidden from the usual tourist trail the stunning village spreads itself around both banks of the Lerryn Creek with a central village green beside the waterside which commands views downriver to seemingly endless and uninterrupted forest and creek, inspiration to writers, artists and all who visit. Kenneth Graham based 'The Wind in the Willows' and the tales of Ratty and Mole on the riverbanks here, overshadowed by Ethy Manor (Toad Hall) high on the hillside above the village. Years later, "simply messing about in boats" is still a big part of the village life with the ebb and flow of the tide seeing plenty of lazy rowing, leisurely canoeing and the chugging up and down the estuary by locals travelling off downriver to Fowey by boat. Gentle canoe expeditions run by Encounter Cornwall (our sister company) operate every day here in the summer, on this unique stretch of water they are not to be missed and can be built into your walking holiday. 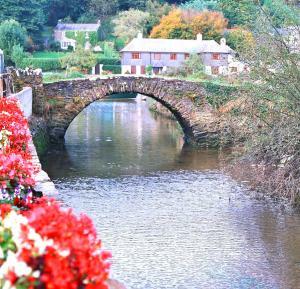 The river has been bridged here for over 700 years and the current tiny arched stone bridge has survived since 1573. The view straight through the village and onto the forest clad creek beyond is a stunning introduction to a village that really can't be matched in Cornwall for its peace, tranquillity and beauty. Linking both sides of the river at low tide is a span of stepping stones which disappear into the waters as the high tide comes flowing in. Wildlife includes a healthy population of ducks, geese and swans in the village with deer, heron, kingfisher, egrets and buzzard as you head into the woods and away from habitation. Hidden in the woods below the river are miles of superb walking alongside uninhabited creeks and inlets that reveal superb panoramas of the estuary and the wildlife. There are former mills, Victorian standing stones and even the overgrown remains of a former ornate garden where a crumbling fountain, plinths and monkey puzzle trees can still be spotted merging into undergrowth now overtaken by natural woodland. Centre spot of the village is the welcoming Ship Inn, a haven for thirsty and hungry visitors, you can enjoy a beer in its lively locals bar, relax in the sunny beer garden or, if you want the full vista, take your drink down onto the riverside to watch the sunset over the creek. The Lerryn Village Shop meanwhile provides sandwiches and cream teas on the village green, the perfect spot to relax after a day’s activity in the River Valley. 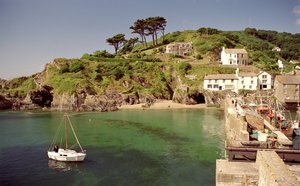 Eight miles west of Fowey after one of the more remote sections of the Coast Path is the famous pilchard and smuggling haven of Polperro. For most walkers it’s a hospitable lunch stop between Fowey and Looe but accommodation is available for those wanting to stay though it can be hard to get for single nights in high summer. Walking in and out on one of our coast path trips is by far the best way to visit what is a popular, possibly the "classic" postcard Cornish fishing village. By arriving and leaving on foot you will see the old harbour at its best without all the bustle and traffic inland that is banned from the harbourside. 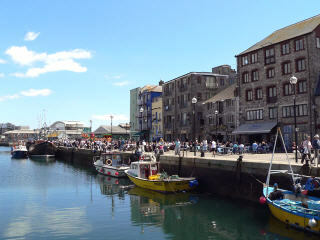 The place does suffer from visitors in the day with a gauntlet of gift shops and cafes leading down the road from the inland car park to the harbour. As a coast walker thankfully you will miss all this and will suddenly arrive around a corner from the wildest of paths and then pause on a natural rock platform to see a stunning almost hidden and unspoilt little harbour set below the wooded valley. Descending to the harbour you will reach a warren of medieval looking lanes hosting an array of ancient cottages and houses including the House on the Props Cafe that still sits on stilts, all packed around a bubbling stream that separates the village as it spills into the rock lined harbour. Beside the harbour the Polperro Heritage Museum gives the lowdown on the smuggling and fishing communities of past eras. 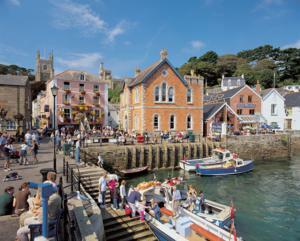 Avoid heading any further inland and your visit to Polperro will retain its well deserved charm. Proudly straddling the estuaries of the wooded East and West Looe river creeks, the bustling quaysides of Looe are linked by its imposing 7 arched bridge or when the tide is in by a short ferry ride across the river divide. East Looe retains the holiday resort theme built up since the Victorian years when the arrival of the railway in 1879 brought the towns new found fame including the first ever bathing machines. 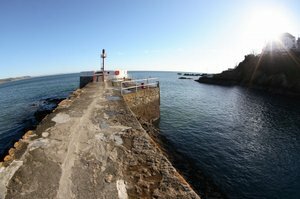 Over in West Looe there is access to quieter beach walking along a rocky foreshore dominated by the offshore Looe Island beyond a protected marine reserve and reached by the Cliffside path known locally as the Khyber Pass (you will see why!) For those who want to end their walk with a dip, East Looe Beach is the centre of the town's waterside activity. The main beach can be rather crowded but the second or Saunders beach offers both swimming and rock pools without the crowds. 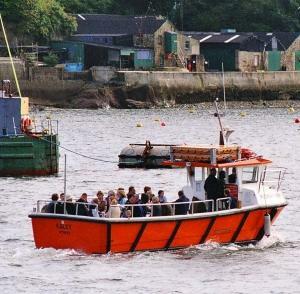 For those with time it’s an easy place to take to the water, regular boat trips to Looe Island, offshore to fish for mackerel or inland up the wooded estuary all start from the quay. 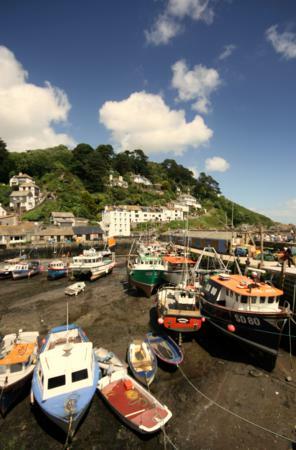 For the hungry walker Looe is large enough to offer some high quality dining experiences around the harbour as well as the usual array of salty pubs and for fresh fish of course you are in your element. A labyrinth of narrow lanes by the harbour provides plenty of shops, cafés and facilities for those who like to wander and you can take in the Old Guildhall Museum based in the old magistrates court and cells or the Harbour itself, stacked high with lobster pots and the trappings of a small scale fishing fleet that plies in and out of the river mouth. For once there is a strong working fishing fleet left here and a visit to the fish market if you are up in the morning to see the nights catch arriving is well worth it. 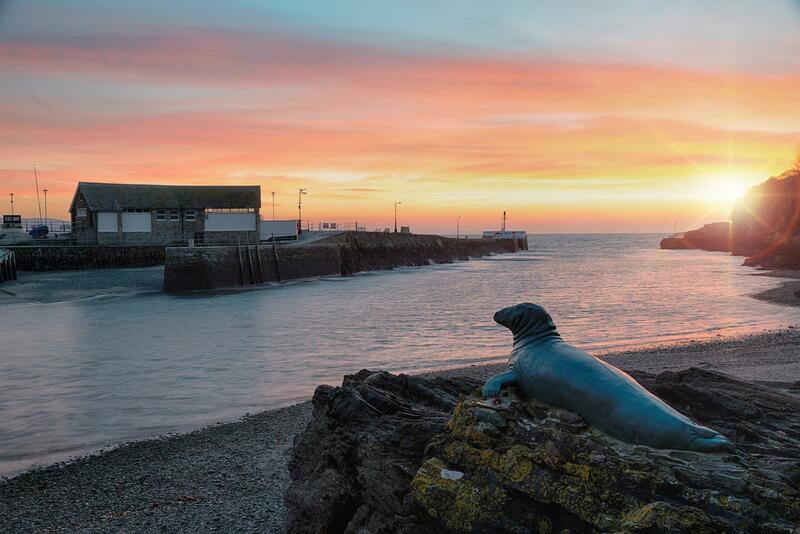 Back from the coastline are the wooded river creeks of the West and East Looe valleys which provide a quieter home to an array of local wildlife, a tranquil spot for a picnic or an easily accessible evening amble. Your last night in Cornwall, Portwrinkle is a pleasant little spot with an open and roomy feel to it. Situated towards the end of the long sweep of Whitsand Bay its simplicity and size retains a degree of charm that the previous villages after Looe have long lost. A pilchard fishing village in the past the cellars still stand at the top of the slipway above the miniscule old stone harbour. To the west a small sandy beach which could bring a welcome dip is surrounded by rocks along with two white painted stone plinths complete with recesses to light fires formally used for guiding the pilchard boats back at night. Today Portwrinkle still has couple of boats working the crabbing trade providing for Looe and the local inland villages. Other than this there is little else in this walker’s staging post. As there is nowhere to eat we tend to use accommodation at Crafthole only ½ mile inland and up the hill where for your efforts there is The Finnygook Inn, a fine 14C coaching inn with good food and huge views not only over the coast but also over the inland estuaries of the River Tamar, Liner and hidden St German’s area. The village of Crafthole itself is small but with a real life character set above the sea in calm pasture lands, tranquil, restful and located in a corner of Cornwall forgotten by all the tourists rushing west from Devon. The largest city on the South West Coast Path Plymouth provides an excellent arrival and departure port for those walking the path. Forget the snooty put downs of the city from those commentators who have never left their travel lodge and could not be bothered to explore it. Sure, much of the commercial centre of the town was destroyed in the blitz and the rebuilt main shopping centre is a featureless concrete drag....but to head for this is not to explore and discover historic Plymouth. For those on the coast path on route you follow the urban seascape, through Plymouth Hoe, around Plymouth Sound and through the ancient Barbican area where you will find a fascinating city alive with maritime history and atmosphere as well a place well stocked with lively bars, restaurants, theatre and art perfect for rest and relaxation before or after your walk. Plymouth’s size and history offers a great contrast to the tiny harbour towns you will have walked through in South Cornwall or compared to those to come in the remote South Hams Devon Coast and for this alone it should not be missed or rushed through. Originally the fishing village of Sutton, Plymouth's importance reflects its position as one of Europe’s largest deep water harbours at the confluence of the Plym, Tavy and mighty Tamar estuaries. Maritime history is awash - Sir Francis Drake defeated the Armada from here, the Pilgrim fathers set sail here and “discovered” America, Charles Darwin set off on his voyage of evolution aboard the Beagle and this was the base for Captain Cook’s adventures in the pacific aboard the Discovery. Don’t forget the legions of less famous passengers however, the port has also been the embarkation point from the UK for thousands of convicts and colonists sent to Australia....all in all not many places have had such an effect on the modern world’s colonial history and can still reveal it as Plymouth does. Right on the Coast path and the overnight stop for most walkers Plymouth Hoe is a fine coastal open area with stunning panoramas over the Plymouth Sound Estuary dominated by Smeaton's Tower, an iconic Red and White lighthouse which was removed from the treacherous rocks of Eddystone, transported here and rebuilt brick by brick - check out the views from the Lantern room. It was here on these grassy banks Sir Francis Drake concluded his famous game of bowls before heading off to defeat the Spanish Armada. The Old Part of the Barbican Centre is a walk back in time, unspoilt with a labyrinth of medieval cobbled streets where timber framed houses and Elizabethan warehouses vie with little jetties and boats, art galleries, craft shops, bistro’s and continental bars. For more exploration visit the Merchants House Museum and The Royal Citadel, Plymouths massive fortress built in 1666 with more great views out to sea from imposing ramparts and well worth a guided tour. Legendry amongst the Royal Navy officer classes, build in end of walk recuperation at the Black Friars Plymouth Gin Distillery for some sampling of the world’s best respected Gin in the restored medieval bar and after all this you still have the excellent City Museum and Art Gallery and the UK’s best aquatic life with Plymouth home to the sharks and turtles of the National Marine Aquarium. For those wanting to see a working side the Fishing fleet still operates along with the fish market from Sutton Harbour and the Devonport area has plenty to see having been home to The Royal Navy past and present. 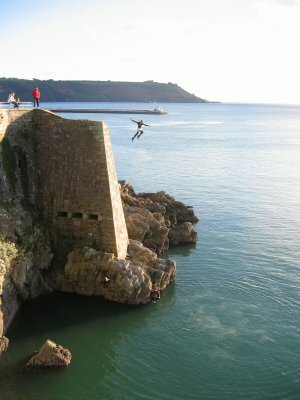 If you like a dip you won’t forget a swim in the Art Deco open air Tinside Pool where you can bob around with world class vistas over Plymouth Sound right on the shoreline. All this and much more is accessed easily on foot by the award winning Plymouth Waterfront Walkway developed by the Council which now forms the first part of the coast path into South Hams. 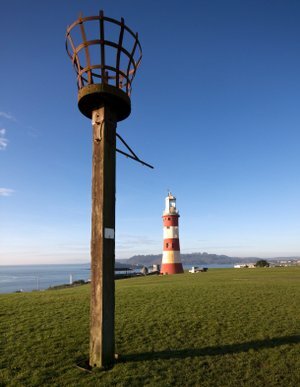 Ten miles packed with sculpture, poetry and historical points of interest along with spectacular viewpoints in, around and across Plymouth Sound - without doubt one of the finest city seascapes in the world. On a practical note Plymouth provides mainline travel connections for quick departures to and from London, Bristol and Penzance and for those that want a break from the coast path the chance for modern restaurants, theatre and nightlife en masse. Of course for those who do want mundane repetitive high street shopping you could always join the uninformed in the inland commercial centre of Plymouth - but on foot you have a choice so make sure you make the right one and encounter the historical gem that is Plymouth - the place the more lazy commentators just never find!